I had finally made it into the big time. I won the Monthly Wine Writing Challenge after my 5th painstaking entry, but I wasn’t ready for the trappings of success. Elated and under the influence of wine, Dolcelatte and celeriac-fennel bisque, I bought cars, jewelry, villas, exotic pets and uncomfortable shoes. I thought I had it good. I thought I was a “baller” (for my international readers, that is a term of hubris in the US – not one of buggery.) Until I hit the bottom of my barrel, and I was over oaked. I was deceiving myself if I believed I was the artisinal toast of the town. I was a Diet Coked-up, punctuality challenged phony in this diabolically friendly competition of utter comraderie. Who was I fooling? Not The Drunken Cyclist. 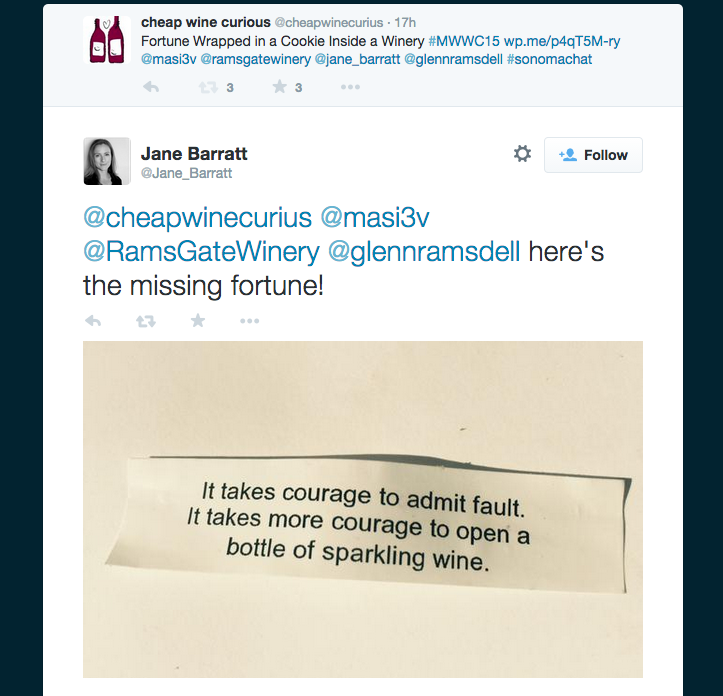 He and my other wine bloggy buddies staged a compassionate, discreet intervention on Twitter. Only days since my infamous #MWWC14 win, Drunko Cycle-Boy tweeted “what are the odds we’ll get a theme from cheapwinecurious for the #MWWC15 ?” Yes, it was tough to see that tweet, but it was filled with love. RockinRed, FranklyWines, came to my defense as all enablers do. “Oh, it’s really about how esoteric her topic is.” Thanks, my friends, but you can’t cover the stains from my glass forever. if I don’t get help, I’ll be trolling the bottom shelves of every last grocery, convenience, drug and fruit stand from Los Carneros to Rockpile. A loosely based, predominantly fraudulent re-enactment of the intervention by a courtroom sketch artist. In parting, I want to leave you with the story of a meme that has renewed and congealed my philosophy of success. 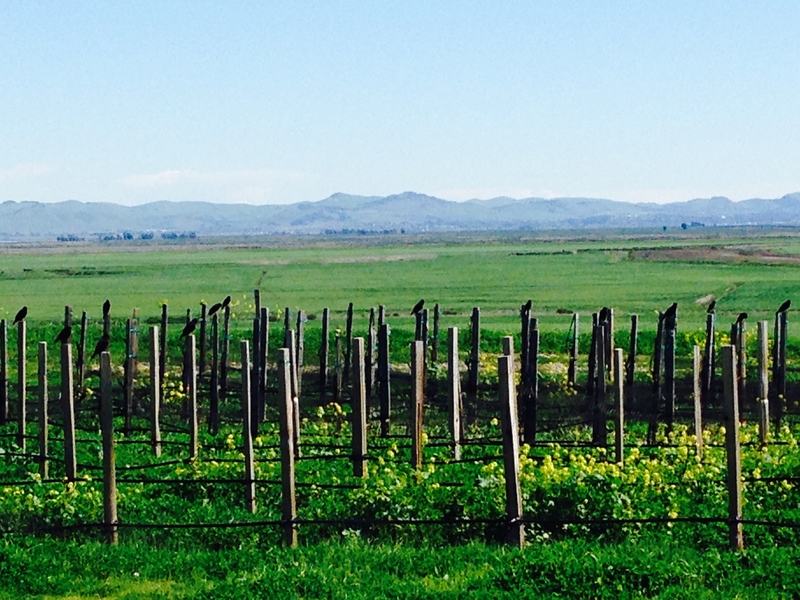 Flock of blackbirds sitting on the vines enjoying the view of the Los Carneros AVA. 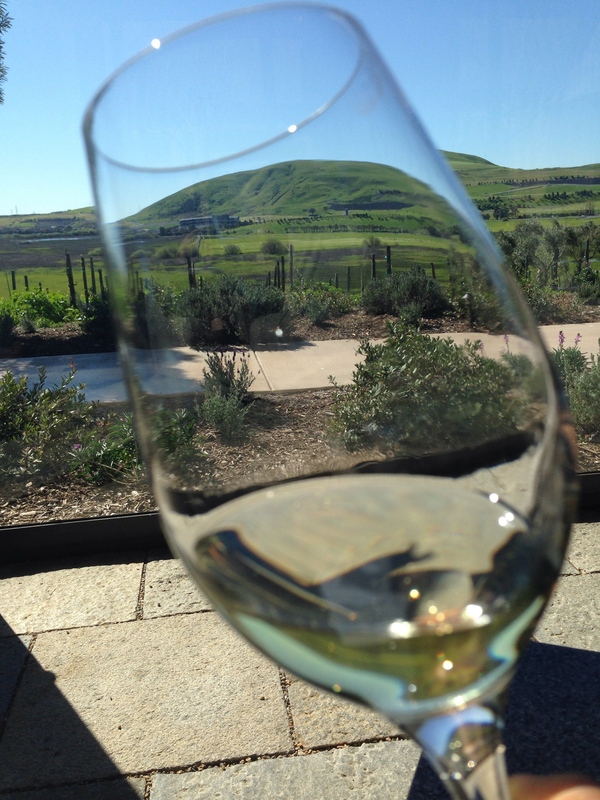 I was having wine at one of my favorite wineries, Ramsgate. I was taking in the view, contemplating my flight of their latest releases of Pinot Noir, Late Harvest Zin and Chardonnay. With me were two incredibly successful people I have had the immense pleasure of knowing for several years. Both mentors of mine at different stages of my career. Both starting exciting new ventures. Both incredibly happy in their personal lives. Both financially prosperous far beyond my bank statement. After I tamed my notions of extreme murderous envy, I felt elatedly grateful they both came to this special place to drink wine with me. 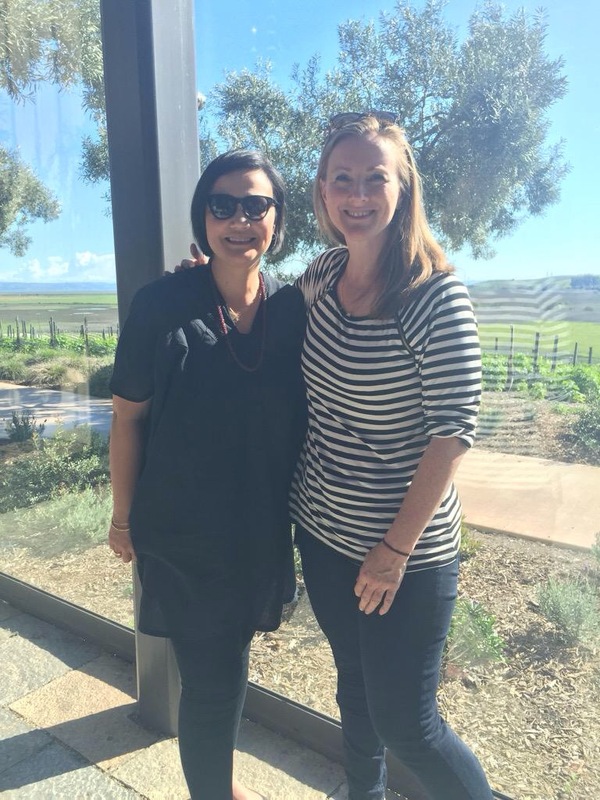 Me & the fabulous Jane Barratt – I like to think of her as Julianne Moore’s younger, more gorgeous sister. She has had an esteemed advertising career and is now founder and CEO of Vested Interest, a tech firm specializing in financial tools….I think that’s all I’m allowed to say. She’s an Aussie and LOVES Oyster Bay Sauv Blanc as much as I do. Yummo! As we were closing our lovely afternoon, being on the heels of Lunar New Year and the Year of the Ram, Ramsgate was providing fortune cookies at the end of their wine service. Oddly, both my guests received the same fortune and I am remiss that I do not remember their auspicious tidings. What I can share is the fortune I received. I took a picture and posted it on my Twitter feed and found that it resonated with my cadre of wineauxs. I witnessed by the number of their likes how meaningful this simple sentence was. This was a profound reminder and validation to me of what truly defines success in life. And with you, I am always happy to share the good fortune. ← Mexican Malbec Cab Blend ¡Verdad! You are so crazy! Great article!! !